1. PRECAMBRIAN DIORITE. This is a coarse grained rock consisting of white albite feldspar, quartz and black hornblende amphibole. It formed when magma equivalent to andesite lava (common in the huge volcanoes of the Andes mountains) crystallised slowly in chambers deep beneath the Earth’s surface. This is one of the oldest rocks in Pembrokeshire and belongs to the Proterozoic Eon of the PreCambrian SuperEon, that preceded the formation of common fossils with hard parts that characterise the Cambrian period at the start of the Paleozoic Era at 542 million years. Tiny crystals of zircon from the diorite have been dated using the radioactive decay of elements to an age of around 643 million years. This is very near the end of the Proterozoic Eon. 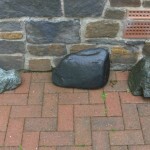 The rock occurs near Johnston (between Milford Haven and Haverfordwest) where it is quarried and widely used in the county. The specimen was recovered from a beach where sea defences of quarried rock had been destroyed by the sea. 2. BLACK ORDOVICIAN SHALE. This is the common rock that makes up much of the north part of the county. It is a soft black fissile shale formed by mud sinking to the sea bed. It records the local history of the area during the Ordovician Period of the Paleozoic Era between 488 and 444 million years ago. There was much volcanism at this time and yellowish layers of altered volcanic ash are interlayered. A large basaltic paleovolcano composed of pillowed basalt lavas lies within these rocks and forms Strumble Head near Fishguard. The sample is from Abereiddy Bay. 3. 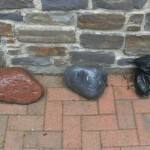 PRESELI BLUESTONE. The heavy blue-green rock is a dolerite or fine grained gabbro with conspicuous feldspar crystals from the north of the county. It is the coarse grained equivalent of basalt lava that formed an intrusive sill into the Ordovician shales of North Pembrokeshire. Thick sheets of this rock are very common and are a part of the Ordovician history of basaltic magmatism (488 to 444 million years). The sheets stand out in north Pembrokeshire as ridges such as Carn Llidi near St. Davids and Carn Meini near Maenclochog and have been called Pembrokeshire bluestones. Some were used to build the inner ring of Stonehenge on Salisbury plain. Geologists believe that these stones were transported there by ice sheets in the last glaciations that finished about 10,000 years ago. In Nature this is only a brief time – a mere blink of the eye on a planet that is over 4,000 million years old. For example the baby seals on the coast of Pembrokeshire have white fur just like their relations in the Arctic. The white coat is to protect them and hide them on snow and ice surfaces from preditors. In Pembrokeshire the sea ice has been gone for 10,000 years now but that is insufficient time for the baby seals to adapt and develop less conspicuous coats for the ice free rocky coast. Many do not believe the Preseli bluestones were transported by ice to Salisbury Plain. During some summers people come to Pembrokeshire to drag a single stone to the coast for shipping by sea towards Stonehenge. So far they have not succeeded as they have found it necessary to put the stone on a plastic sheet to drag it or usually to get a helicopter to sling it. To me they are proving that man could not have moved them so far in the Bronze Age. 4. PORPHYRITIC DACITE LAVA. This is a pretty rock composed of fine-grained hard siliceous lava carrying an abundance of white feldspar phenocrysts. It formed part of an ancient volcano in North Pembrokeshire. 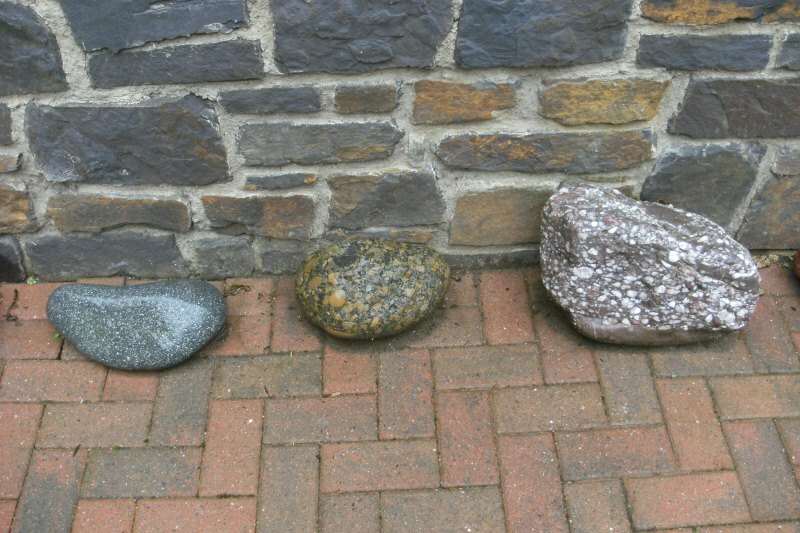 These rocks were until very recently thought to be of Precambrian age but recent work by the British Geological Survey (assessing their gold content) has shown them to belong to the Ordovician period (488 to 444 million years). The sample is from Newgale beach. 5. RHYOLITIC AGGLOMERATE. 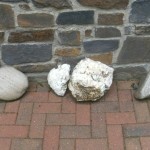 This boulder, also from Newgale beach, is composed of angular orange colored fragments of rhyolite. It is from the Ordovician Roch Rhyolite formation that extends from Roch to Treffgarne Gorge in the north of the county. It is a volcanic rock formed by the explosion of a rhyolite dome to produce a deposit of angular fragments of identical rhyolite. This contrasts with the more rounded fragments and the wide variety of rock types found in a rock called conglomerate that owes its origin to erosion. The rhyolite agglomerate was a part of one of the Ordovician paleovolcanoes of north Pembrokeshire formed between 488 and 444 million years ago. 6. DEVONIAN QUARTZ CONGLOMERATE. The low sea cliffs at Sandy Haven beach contain impressive layers of white quartz conglomerate contained in the red mudstones and shales. These layers of conglomerate formed in stream channels in an estuary with red mudbanks in the Devonian period from 416 to 359 million years ago. This was the Age of Fishes and the headshields of primitive Pteraspid fish are sometimes found in these conglomerates and sandstones. There are some fragments of volcanic rocks also within the conglomerate giving some idea of the land that was being eroded to form these channel deposits. The volcanic fragments are probably derived from the older Ordovician paleovolcanoes. 7. DEVONIAN RED MUDSTONE. The red boulder is also from Sandy Haven and shows the red mudstone that in the Devonian period formed as mud banks in an estuary. The age of this rock is between 416 and 359 million years. 8. FOSSILIFEROUS GREY LIMESTONE. 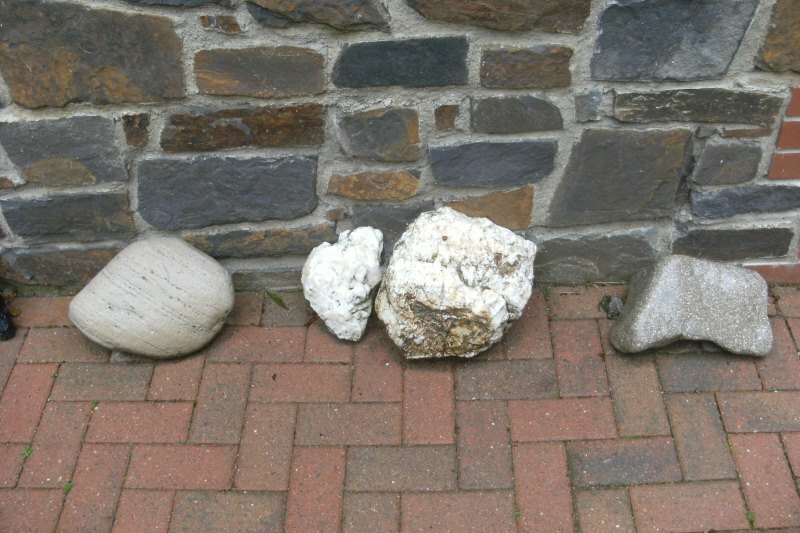 From the south of Pembrokeshire this fine-grained hard grey limestone with white calcite shell and coral fossils has been an important building stone in Pembrokeshire. The late 19th century Victorian forts of Lord Palmerston around the Milford Haven Waterway and at Tenby are built of shaped blocks of this rock. The limestone formed in the sea during the early part of the Carboniferous Period between 359 and 325 million years ago. 9. COAL. South Wales has long been famous for its coalfields and the coal seams extend right across South Wales. The coal belt has a north-south width of about 30 miles but in Pembrokeshire it has been compressed into tight folds and is much faulted to a width of only 6 miles. Coal is fossil peaty humus that formed in swamps and marshes that supported a luxuriant vegetation. The Coal Measures were deposited under estuarine and fresh-water conditions as alluvial muds and sands, swamp clays and delta fans and aprons through which large rivers meandered. This coastal environment records a shallowing of the sea after the Carboniferous Limestone formed. Both the Limestone and Coal Measures formed during the Carboniferous period between 359 and 299 million years ago. 10. QUARTZ SANDSTONE. A cream colored coarse sandstone with internal laminations. This is a very rare rock in Pembrokeshire but it once formed a cover over the county. It formed during the Permian Period (299 to 251 million years). The cover has been entirely eroded from Pembrokeshire but can be found on the sea floor around Pembrokeshire and is known close to Dinas Head. Specimens can be obtained on the south side of Freshwater West beach where they have an interesting origin. In the south of Pembrokeshire, the Permian sandstones overlay the grey Carboniferous Limestone. Some time in the past caves and sinkholes formed in the limestone. Some of the sink holes were filled with Permian Sandstone debris that collapsed into them. Today it is the erosion by the sea of the grey Carboniferous limestone that is releasing these fragments of the former Permian cover onto the south coast beaches. Pembrokeshire is renowned for its golden quartz sand beaches. But today there is no source rock to supply golden quartz sand. It is the golden beach sands that represent all that is left of the lost Permian cover. A visit to Barafundle Bay and the adjacent Broad Haven beach in south Pembrokeshire will show a lot of golden quartz sand and cliffs of grey Carboniferous limestone without any present day source for the sand. 11. WHITE VEIN QUARTZ. In the black Ordovician shales of the north of the county are many veins of white quartz. These formed in a major period of mountain building when the then continents of Laurentia and Gondwana collided to form the super continent of Pangaea. During the collision in upper Paleozoic times, folding and faulting occurred in what is known as the Hercynian mountain building episode some time between 480 and 290 million years ago. It was this episode that produced the folding and faulting visible in the Paleozoic rocks of the seacliffs of Pembrokeshire. One of the main structures formed is the major east-west syncline of the South Wales Coal Field. Some of the quartz veins are mineralized with lead, copper and zinc. At one place at Dolaucothi in Carmarthenshire, quartz veins contain gold that was mined by the Romans and again more recently. The mine is today open for tourism. 12. GLACIAL ERRATIC BLOCK OF AILSA CRAIG GRANITE. The small island of Ailsa Craig off the west coast of Scotland is a microgranite formed around 60 million years ago. It has a very distinct appearance known as salt and pepper and is famous for making curling stones. 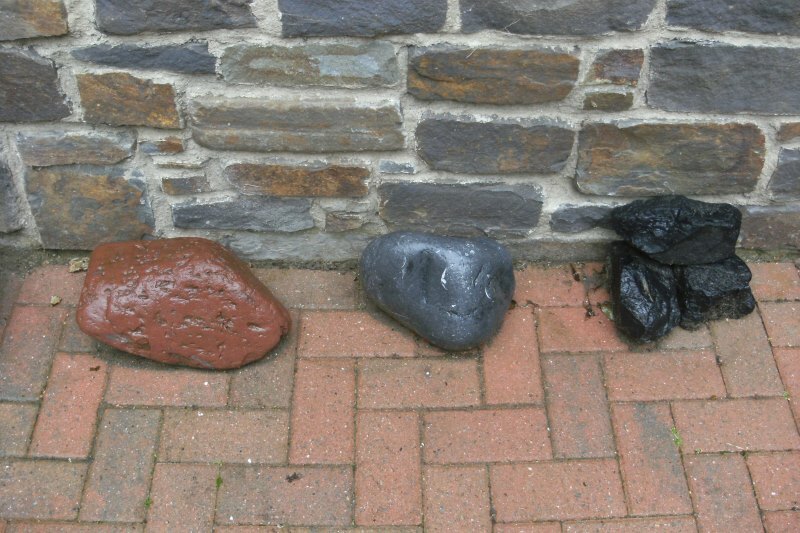 Early geologists mapping Pembrokeshire in the 19th century were surprised to find blocks of it scattered about the county. They used its presence to help reconstruct the paths of great ice sheets during the Great Ice Age. Ice sheets plucked up pieces of Ailsa Craig microgranite and carried it south down the Irish Sea and into Pembrokeshire where it was deposited when the ice melted and surface glacial debris deposits formed during the last two million years. The specimen was collected on Freshwater West beach. 13. THE FACING STONE ON THE HOUSE. It was the owners intention to use Red Devonian sandstone derived from the garden and adjacent fields to face the house. 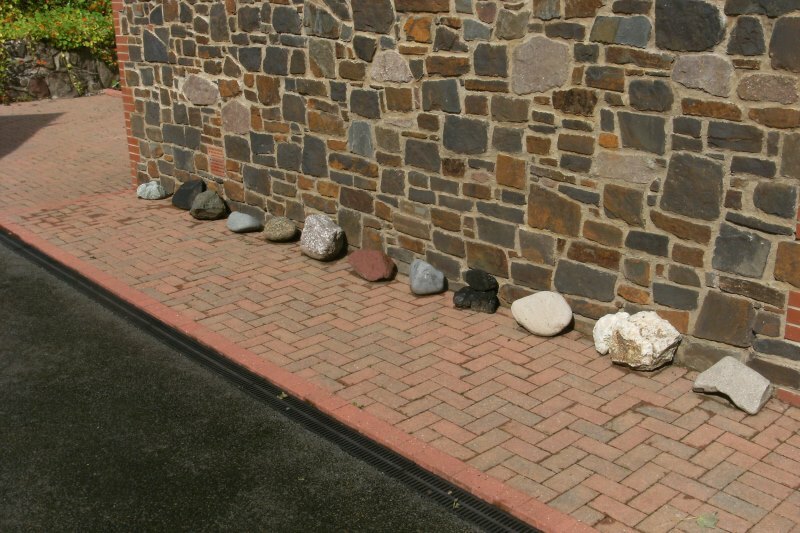 The rock was collected over a number of years. However these stones have very irregular shapes (see the many boulders facing the terraces). 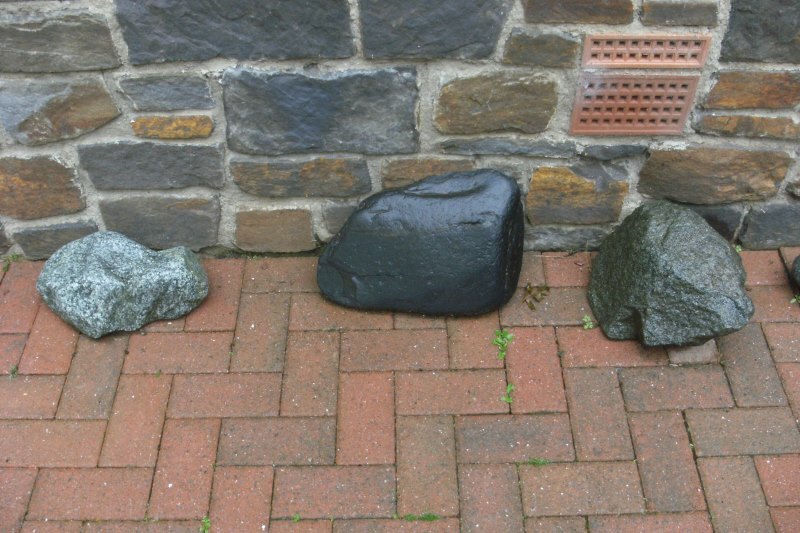 Shortly before the house was built a Welsh farmer discovered a very fine slabby sandstone that is now sold as Swansea Stone. These are yellowish sandstones with thin black coal laminae and come from the Carboniferous South Wales Coal Field. They were used superbly for Haverfordwest Railway station and the owner decided to switch to these as they can be laid in courses showing grey and golden surfaces and hiding the black laminae. Work started on facing the walls this way following the Roman style of stonework and bringing the wall up to level every three feet. 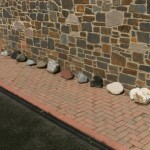 However as soon as the first course was completed Pembrokeshire Coast National Parks Inspector Arwell Williams arrived on site and stopped the work insisting that stonework in the National Park had to be random without courses. This was done and the nice slabs placed vertically so that their irregular shape showed. This was a great disappointment for the owner as the original local red sandstone could have achieved the same end result without the expense of buying the Swansea stone. By placing the slabs of Swansea Stone vertically, many black carbonaceous surfaces show. 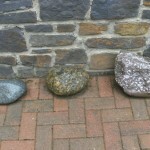 To brighten this the builders included some slabs of pink Devonian sandstone derived from the garden. The source bed for this sandstone and the numerous boulders of it that originally littered the garden can be seen behind the garage where a 15 foot thick bed of sandstone dips seawards.